Governor, Smt. Urmila Singh giving away prizes on the occasion of H.P. 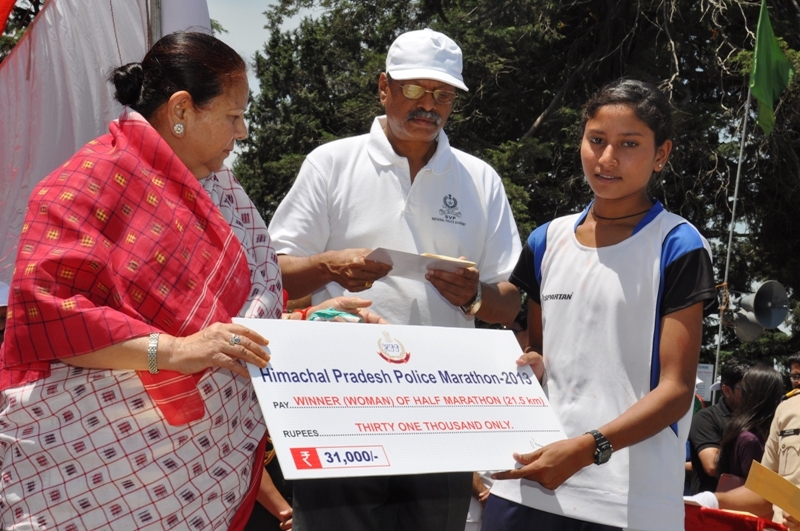 Police Marathon-2013 at Shimla today. Governor Urmila Singh has called for renewed commitment and action in fight against drugs and substance abuse. She was speaking after giving away prizes to the winners of International Day against Drug Abuse Half Marathon organised by the Police department here today. Governor said that youths should be made aware of drug abuse and it was every inpidual's responsibility to spread awareness. She said that marathon had been instrumental in drawing the attention of the people and motivating them to be a part of the event so as to contribute towards the social cause. Smt. Urmila Singh said that State Police Department had been organising such events with a view to associate the common man in checking the drug menace and saving youth from falling prey to drugs. Earlier Shri B. Kamal Kumar, DGP welcomed the Governor. Smt. Satwant Atwal Trivedi, DIG presented the vote of thanks. On the occasion jawans of H.P. Police, presented a colourful cultural programme . People from different walks of life participated in the half marathon. Besides, ten kilometers mini marathon, three kilometers dream run in four categories and run for disabled children was also organised.